Like the name suggests the pattern is designed to look like a squiggle, who can remember before mobile phones, sitting down next to the household telephone squiggling on the phone pad? haha brings back memories!! 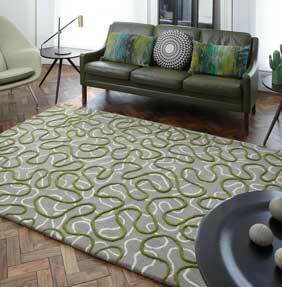 Well if you do, then no doubt once or even twice your squiggle looked like the design on our new Squiggle rugs. The squiggle pattern is enhanced by a neutral background of light greys and cream, this ribbon like squiggle is raised above the base to give a textured appearance.